The Green Workplace: Just when you thought the Prius couldn't get any cooler..
Just when you thought the Prius couldn't get any cooler.. The all-new 2010 Prius hybrid will feature solar panels on some of the high-end models that will power the electronics like the air conditioning. That's right. Solar panels powering the car. 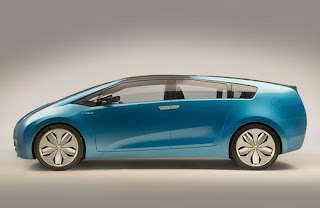 The next Prius is rumored to be even more efficient than the current generation, a trend I've come to expect from a company that believes in Kaizen principles or "incremental improvement". But seriously, to rant a tiny bit on our good friends in Detroit, what is is going to take to get you to realize we want beautiful, fuel efficient cars, not gas guzzling trucks? Bill Ford, Mr. Environmentalist, worked with Bill McDonough to build acres of green roofs on his Michigan plants, but the cars he sells are still gas guzzlers! Seriously, if Americans are going to keep jobs in America, we're going to have to bring the very best of designers and green thinkers into our factory floors. While I'm not a huge fan of the looks of the Prius (either new or existing), I am a huge fan of Toyota's product. I've owned German and American cars before and I have to say, hands down, the Prius has been the easiest and most reliable (and gets the best gas mileage, though the VW is pretty good, too - about 35 MPG). Looking forward to checking out the 2010 version! Your article is so good, Can I transfer it?